After more than ten years since the start of the renovation works, Alba Iulia can now take pride in putting together one of the country’s most beautiful heritage fortifications. Started a few years ago, the Rosia Montana heritage centre restoration continues with success, after an historic landmark and a heritage museum in the area have already been reintroduced in the tourist circuits. The White Citadel Carolina, an 18th century Vauban fortification has been in restoration for ten years, most of the works being financed with European funding, reads a communiqué sent to Nine O’Clock. According to Alba Iulia City Council representatives, the entire project has cost around EUR 50 M. “The project aimed to renovate the Carolina citadel has been one of the most complex urban projects that has ever been done in Romania, complex first of all due to the site surface (over 110 hectares) and secondly due to a wide range of architectural objectives, of whom worth mentioning six monumental baroque gates adorned with bas-reliefs and seven bulwarks,” explained the head of Alba County Heritage Authority Matei Drambarean. 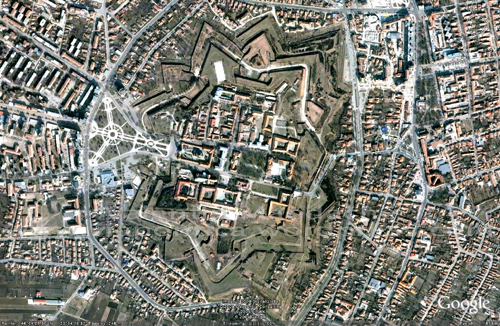 One of the country’s best known heritage sites and the chief tourist attraction in Alba, the White Citadel was built between 1714 and 1738 and is considered the most representative Vauban bulwark fortification in south-eastern Europe. Following the Austro-Hungarian Empire siege and the 1683 Turkish army defeat, Austrian troops start to march through Transylvania in the late 17th century. The citadel was built following a 1714 decree of Emperor Carol VI of Habsburg, plans were made by Italian architect Giovanni Morando Visconti. Most of the construction works were conducted under the helm of French-born aristocrat Eugene de Savoie, the headstone being placed on November 4, 1715. The fortification was finished in 1738, summing up an impressive number of over 20,000 bondmen. Following the Vauban tradition, quite common in western Europe at the time, the citadel was built under form of a star with thick walls and seven imposing bulwarks. “All these projects have the central aim of bringing back to the community parts of its own history, of giving back a cultural heritage. Two other heritage buildings will be restored next year, the old school and the library“, Adrian Gligor , Heritage and Development manager with Rosia Montana explains. The museum was inaugurated as part of the European Heritage Days, an event that, each mid-September celebrates history and the projects people put together throughout the continent to bring back community history to a tourist circuit.